England captain Chris Robshaw admits defeat against Australia would be tough to accept and a setback for his side going into next year's Six Nations. Robshaw's side face the Wallabies at Twickenham on Saturday, having been beaten this month by New Zealand and South Africa before a win over Samoa. 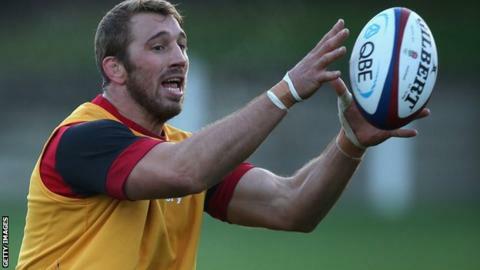 "If we finish with a loss it would be very hard to take for all the guys," Robshaw told BBC Radio 5 live. "To lose three out of four games would be tough." The 28-9 victory over Samoa last weekend ended a run of five successive defeats for Stuart Lancaster's side, but Robshaw is well aware of the importance of beating one of the leading teams in world rugby. "It's huge," he continued. "To get that confidence again and to continue to move forward going into the Six Nations, you want to finish your previous game with a win." And while Robshaw says this weekend's fixture may have a bearing on next year's World Cup - with Australia in England's group - he insists his side are focused more on the here and now. "Potentially it's a small sub-plot, but there is so much at stake at the moment," the 28-year-old added. "It's about this Saturday, not a year on Saturday. "Both sides want to finish their season with a win, otherwise it lingers with you a little bit more. It's up to the players to go out there and produce the goods on the pitch." England forwards coach Graham Rowntree has already spoken about the dangers Australia pose, and Robshaw believes the Wallabies provide a very different challenge to the All Blacks or the Springboks. "They've always been very smart," Robshaw said. "Expect the unexpected whenever you play them. They are a very fit side who want to move the ball around and we have to be on top of our game. "That's the brilliant thing about this series. Every team you play is very different and in order to beat them you have to be smart and mix your game up." And having duelled with Richie McCaw and Schalk Burger already this month, the England open-side flanker is looking forward to the challenge of facing the highly rated Australia captain and breakaway Michael Hooper. "A cracking player," Robshaw said. "Extremely good over the ball, extremely quick in the loose but it's his link play and his offloading that separates him from most." England have named the same 23-man squad that overcame the Samoans, with Lancaster set to confirm his starting XV on Thursday morning. Three changes are expected, with Dylan Hartley, Tom Wood and Billy Twelvetrees returning to the side and Rob Webber, James Haskell and Owen Farrell dropping to the bench. Listen to 5 live Rugby from 20:00 GMT on Thursday for the latest from the England and Wales camps ahead of the final round of autumn international matches.